Mumbai, Jul 7 : AirAsia seems to have sensed an opportunity in the underserved northeast region, which has only two direct flights to Mumbai and Bangalore. At a company event on Friday, Chief Executive Tony Fernandes said the airline would focus on the Northeast destinations but did not specify routes. AirAsia has launched services on the Bangalore-Chennai and Bangalore-Goa routes. 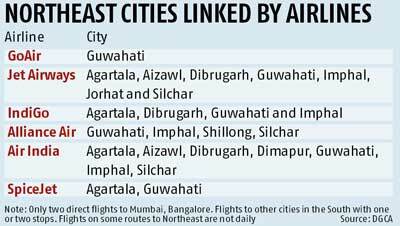 According to schedule filed with the Directorate General of Civil Aviation (DGCA), there are only two direct flights linking Guwahati with Mumbai and Bangalore. Both are operated by IndiGo, India's largest domestic airline. Most of the other flights to West and South India from this region have one or more stops. Guwahati also has direct flights to Delhi and one or two stop flights to Ahmedabad, Pune, Hyderabad, Chennai and Jaipur. None of the other northeastern airports has direct connectivity with Delhi, Mumbai or airports in South India. The route dispersal guidelines, which mandate capacity allocation by airlines in underserved areas, were revised in March. Under the new norms, airlines are required to deploy six per cent of total capacity on routes in the northeast, Kashmir, Lakshadweep and Andaman and Nicobar Islands. However, this guideline was not implemented due to objections from airlines. Under the earlier norms, Bagdogra in West Bengal was clubbed with northeast airports, requiring mandatory deployment of capacity. "There is a demand on Northeast routes but it is a price-sensitive market. Traffic is dominated by students and inhabitants from Northeast settled in other parts of country. Route feasibility depends on cost structure. Besides, fuel prices in Northeast are high,'' another executive said. Tour companies have, however, welcomed AirAsia's announcement to explore Northeast market. "There is a VFR (visiting friends and relatives) and leisure travel traffic to Northeast. There are constraints like quality hotels at present but these will ease once travel demand grows. Airlines, which fly twin class (economy and business) configuration, might have a feasibility issue but I do not see a problem for low-cost airlines offering single class service,'' said Rakshit Desai, managing director of FCM Travel Solutions.